Judas, Israeli writer and peace activist Amos Oz’s first full length novel in many years, interweaves emotional themes of loneliness, bereavement, whether the dead die in vain, childlessness and grand-childlessness with conceptual themes that include treason, realism vs. idealism, the validity of nation states in general, and the wisdom and necessity of creating a Jewish state in 1948. The latter echoes contemporary debates about two-state vs. one-state solutions to the Israel-Palestine conflict; Oz, a founder of Peace Now, is a long time advocate of two-states. The novel is set in the Israeli side of divided Jerusalem in the winter of 1959–60. Shmuel Ash is a bearded, overweight, and asthmatic Marxist who has dropped out of graduate school in Judaic Studies at The Hebrew University following his father’s business failure in Haifa. To add insult to injury his fiancé has left him and married her previous boyfriend. Ash’s masters thesis topic was Jewish views of Jesus, and his name calls to mind the Yiddish writer Shalom Asch whose trilogy of novels on New Testament themes offended Jewish readers who accused him of promoting Christianity. Shmuel infers from his reading of the Gospels that Judas was the only one of Jesus’ followers who believed in Jesus’ divinity when Jesus was alive, and that it was Judas who convinced Jesus to go to Jerusalem and be crucified, thinking that his divine teacher would expel the nails, climb down from the cross, and usher in the Messianic Age. In Ash’s speculative version were it not for Judas no one would have heard of Jesus outside of Galilee where the latter would have probably died of natural causes decades later. Judas’ name is synonymous with traitor and Jew, but in Ash’s view he was ironically the first true Christian, a misguided idealist whose scheme resulted in his teacher’s death and eventually the founding of a new religion. With no means of support Ash takes a job that offers him an attic room and a small salary in exchange for keeping an elderly invalid, Gershom Wald—a retired history teacher with an encyclopedic knowledge of the Hebrew Bible, Talmud, and rabbinic literature—company between 5:00–11:00 p.m. each night. Wald resembles another Gershom, Jewish history and philosophy professor Gershom Scholem who was a generation younger than Wald but like him opposed Marxism and emphasized solidarity with the Jewish people. The other resident of the house is Wald’s former daughter-in-law Atalia Abravanel, an attractive widow 19 years Ash’s senior, an investigator in the office of a private detective, and Ash’s employer. Scholem’s house was on Abarbanel Street (an alternative English spelling of Abravanel), and Atalia’s house is located on a fictional street that intersects with Ussishkin Street (as does Abarbanel Street) in Jerusalem’s Rehavia neighborhood. Two dead people are also very much present: Atalia’s father Sealtiel, who died in 1950, and her husband and Wald’s son Micha, who was killed in action in April 1948. At the time of his death Micha was a 37-year-old professor who had lost a kidney to a childhood illness and failed to mention his health history when he enlisted in the Haganah. When Atalia and Micha married both their fathers were widowers, and Gershom accepted Sealtiel’s invitation to come live with him in his house. After her husband’s death Atalia also moved back to her father’s house by which time Sealtiel was an outcast for opposing the decision to create a Jewish state. Throughout the 1930s up until the winter of 1947–48 Sealtiel had been a director or trustee on the boards of both the Jewish Agency and the Zionist Executive. In November 1947 when the UN voted to partition Palestine into Jewish and Arab states, the Palestinian Arab leadership categorically rejected the plan and attacked the Jewish community initiating a civil war that lasted until Israel declared its independence on the eve of the British departure on May 15, 1948, when the neighboring Arab countries invaded. In the midst of that civil war in 1947–48 Abravanel argued that it was not too late for the Jewish and Arab communities to live side by side in peace, and to end the civil war and prevent a larger war the Zionist leadership should publicly decline to create an independent Jewish state. In response to his proposal he was given 24 hours to resign his positions, after which he was widely regarded as a traitor and lived his remaining years in seclusion. Abravanel’s proposal echoes that of Brit Shalom, a group of Jewish intellectuals in Mandate Palestine founded in 1925 that favored a binational state. The group’s membership never exceeded 100 all or nearly all of whom were Jewish, and after the Arab riots of 1929 its membership declined sharply and the organization ceased to exist by the early 1930s. Previous Arab riots targeted Zionist immigrant communities, but the 1929 Arab rioters attacked all Jews: anti-Zionists as well as Zionists, those who had lived in the country for centuries as well as immigrants, religious and secular, those of middle eastern as well as European origin, since all Jews enjoyed the protection of the British authorities. The 1929 riots and the Arab revolt of 1936–39 convinced most Jews in Mandate Palestine of the necessity of an independent Jewish state. When in the 1940s some former Brit Shalom members formed Ichud, which also advocated a bi-national state, it attracted even fewer members than had Brit Shalom, all Jewish, including Martin Buber and Judah Magnes. But Shealtiel Abravanel’s proposal even fell short of bi-nationalism, arguing that Jews in Palestine should agree to remain a minority like the Jewish minorities in other Arab countries, essentially a Hebrew speaking diaspora community that would culturally fortify diaspora communities worldwide, in the manner of the fin de siecle Cultural Zionism of Ahad Ha’am (who died two years before the 1929 riots). Abravanel’s namesake, the biblical Shealtiel, was the second exilarch and the first descendant of King David born in the diaspora. Wald refers to Abravanel as Sephardic aristocracy, and the real life Abravanel family traces itself back to descendants of the exilarchs who migrated from Babylon to Muslim Spain, acquired the title Don in Christian Spain, and found new homes throughout the diaspora after the expulsion. Just as Shmuel Ash and his New Testament studies call to mind Shalom Asch, the name Shealtiel Abravanel has strong diaspora associations. Abravanel spoke Ladino, Hebrew, Arabic, Turkish and Greek, frequented Arab coffee houses and had Arab friends, which in the light of his resignation from Zionist institutions made his fellow Jews question his loyalty. Prior to Micha’s death Wald shared Abravanel’s outlook, but thereafter he became a loyal follower of David Ben-Gurion, whom he viewed as the greatest Jewish leader since and perhaps even greater than King David. According to Wald, Atalia holds onto her father’s bitterness without his idealism, which keeps her relationships with men brief and fleeting, including Shmuel’s predecessors in the attic room whom she bedded and fired one after the other. On the other hand, plenty of men behave in a like manner, and no one calls them bitter. Oz appears to associate Abravanel’s idealistic opposition to Ben Gurion’s realism with Ash’s Judas’ tragic idealism. As Ben Gurion’s decision to accept partition placed him in opposition to both bi-nationalists on the left and the revisionists on the right, so too today’s Israeli proponents of two states such as Oz and the Zionist center-left parties in the Knesset are opposed by both the anti-Zionist left and the right wing parties tied to the West Bank settlers. Oz’s novel of ideas doesn’t spell that out, but it hints that failure to revive the moribund peace process and achieve a two-state solution will result in the end of Israel, and its Jewish population will become the minority Shealtiel envisioned. Readers may question whether Oz’s dramatic narrative, characters, and prose can carry the weight of his ideas. Shmuel is a writer/scholar who lives in his head (which Atalia finds refreshing compared to alert men who approach her with agendas and objectives) whose bildungsroman—including childhood flashbacks, concerned letters from his father and older sister, and a chapter set in the First Century dramatizing his theory about Judas and Jesus—is less compelling than the ideas conveyed by Wald throughout but most notably in a two and a half page single paragraph monologue near the end. Oz’s handsome prose commands readers’ attention even if Shmuel’s personal growth does not. 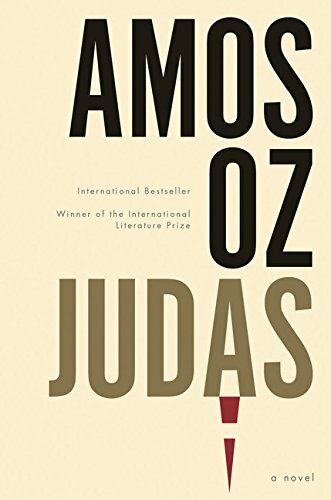 For Oz’s fans and liberal Zionist fiction readers Judas is a required text whose writing is its own reward.